Butler v. DaVita Healthcare Partners, Inc.
A woman is a longtime dialysis patient as a result of her lost kidney function. She presents to DaVita Healthcare Partners, Inc., a health care provider specializing in kidney care. A graft (a small tube connecting an artery to a vein) is placed on the woman's upper right arm to perform dialysis. The woman continues going to DaVita to receive her dialysis treatment for approximately eight years. During this time, there is no documentation of an evaluation of the woman's graft and at no time is the woman sent to an interventional radiologist. One day the woman presents to DaVita for her routine dialysis, which occurs about every other day. As a result of blood flow problems, the woman is sent to an interventional radiologist. In performing an angioplasty, the interventional radiologist finds stenosis in the woman's graft. The interventional radiologist never communicates the seriousness of the graft's condition to anyone responsible for the woman's care and never refers the woman to a surgeon. The next day the woman reports for her usual dialysis treatment. Her graft is cannulated (a thin tube inserted into a vein to provide venous access) by a patient care technician, but none of the physicians had written an order allowing cannulation. Two days later, the woman bleeds to death due to the erosion of her shunt (a passage allowing fluid to move from one part of the body to another). The woman's son, a resident of Maryland, filed a wrongful death medical malpractice lawsuit in Prince George's County. He claims that DaVita violated the standard of care by (1) failing to monitor the woman's graft condition, (2) failing to appropriately report and document the graft condition, (3) failing to timely send woman to an interventional radiologist upon graft deterioration, and (4) failing to stop dialysis through the eroded graft. The woman's son claims that had DaVita met the standard of care, his mother's graft would have been appropriately treated, and she would not have died. Mark Edelman, M.D. - board certified in radiology and interventional radiology with clinical experience in the field of interventional radiology. Dr. Edelman has Maryland connections. He was born in Cumberland, Maryland and did a fellowship at Johns Hopkins. He practices in Illinois. Stuart Friedman, M.D. - board certified in internal medicine and nephrology and with clinical experience in the field of nephrology. He is based in Los Angeles at Cedars-Sinai Medical Center. Two doctors and a nurse signed the certificate of merit which is unusual. Also filed with the Complaint was the client's signature on a "warning" about the client's potential civil liability for the filing of the claim which is also quite odd. The law firm that filed the case is in Arlington, Virginia. This seems to be a failure to communicate case. You do not want to cannulate (insert a needle and a catheter into) a weak shunt. The nephrologist knew the shunt had been compromised, the Plaintiff alleges, but did not communicate this to the patient care technician who cannulated her graft. She bled to death as a result. Often these cases are about failure to monitor for bleeding. The standard of care is to check on the shunt frequently to ascertain that no excess bleeding is occurring. If you have been a victim of malpractice, our medical negligence attorneys handle serious injury and wrongful death cases. Call us today at 800-553-8082 or get a free, no obligation online case review. 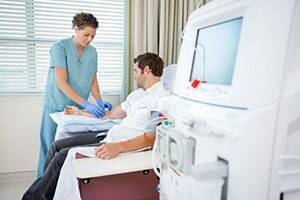 A 2017 lawsuit in Baltimore against a dialysis center that allegedly did not cap and clamp the port when transferring the patient to another machine. CALL our lawyers today at 800-553-8082 or get a free online medical evaluation of your malpractice injury and wrongful death claims. We handle claims throughout Maryland and Washington D.C. We can help you find out whether you have a viable claim that may bring you compensation for the harm that has been done.